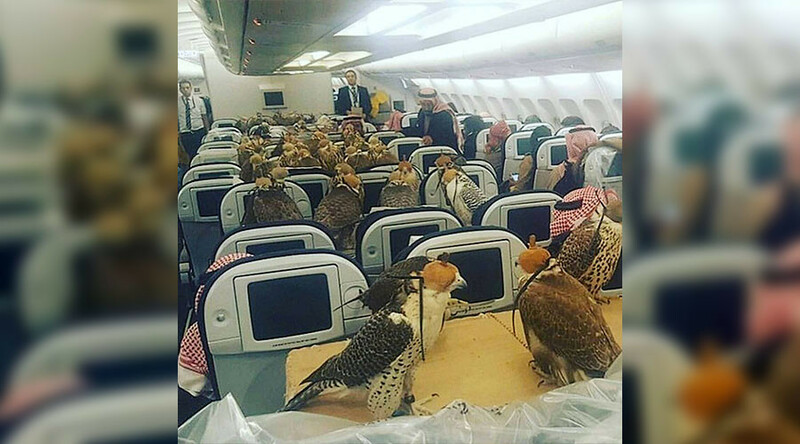 An Etihad Airways pilot recently shared a bizarre photo of a commercial jet filled with 80 falcons, each with individual tickets paid for by a Saudi prince. The unusual image of the flock of birds perched in the cabin of the plane went viral after Reddit user ‘lensoo’ posted the photo on Monday, explaining that his “captain friend” sent the image after the prince bought a ticket for each of the birds of prey. Falconry is extremely popular in the Middle East and most airlines that service the region have some form of policy for allowing birds on board as long as there are passports for the animals. While a flock of birds is certainly one of the more unusual things you’re likely to see on board a passenger jet, it is (by far) not the most bizarre species ever seen on a plane.